Invisalign braces are clear aligners that gently move teeth without the need for metallic bands or wires. 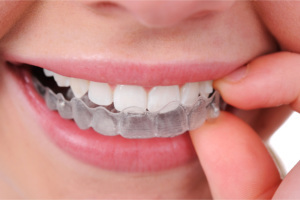 Up to 85% of adults are good candidates for Invisalign. Invisalign braces are so clear that often no one will notice you are wearing them, and treatment can often be completed in less than a year. For minor spacing or crowding, this treatment time can often shrink to under six months. Many dental insurance plans cover all or part of the cost of Invisalign. Dental Arts has been awarded Preferred Status by Invisalign for having successfully completed more cases than most other offices in the area.